There is a high number of Palm tree types, but most of them have a similar root system which is long and fibrous. This can cause the roots to work their way under walls, pavers and around water pipes which causes many structural problems. To avoid this, it can be necessary to cut down the palm and remove the stump, and this in itself can be a real challenge. 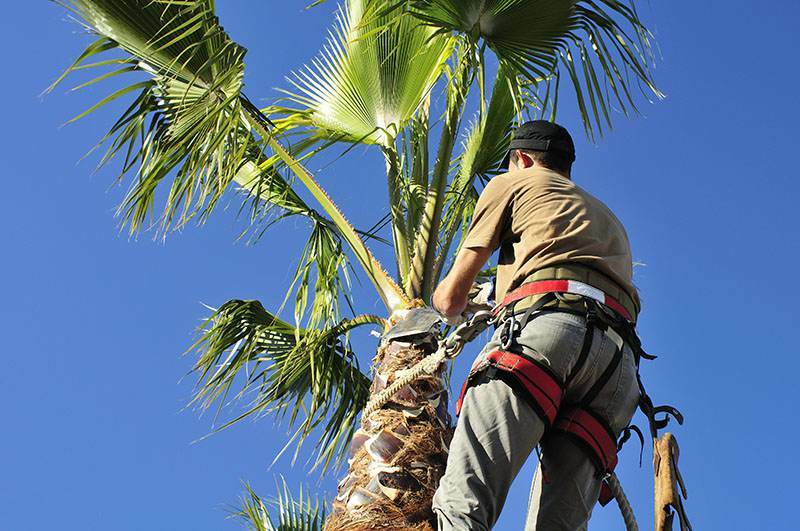 Las Vegas Tree Removal Pros have dealt with many palm tree stumps over the years for Las Vegas homeowners and businesses. Aside from having a troublesome palm tree cut down, there are other reasons to have a palm stump removed. Stumps are an eyesore – A stump which just sits there is never very pleasing on the eye, and when weeds or other plants begin growing on them they look even worse. Stumps are a waste of space – Having a stump in the middle of your area can eat up valuable space, and can stop you not only having a clean area but preventing you from carrying out other projects. Palm Stumps are a hazard – Depending on your area, some stumps can be small and become hidden, this makes them unobvious to the eye and can cause tripping, and in many cases, this would be children running around. This involves digging all around the stump to bare the roots and then with the use of a chainsaw or specialist manual saw, all the roots need to be cut. Then the stump must be pulled from the hole and disposed of. This involves cutting as much of the stump off as possible. Then you need to drill holes that are up to 12 inches deep and a few inches apart in the top of the stump. Now, more holes should be drilled at right angles down the side of the stump to meet the other hole. Next, a hefty amount of potassium nitrate should be poured into the holes and topped up with water. Wait for around six weeks until the stump can be broken up and removed. Other methods available are similar in process to killing the palm stump, but the very best way is the last way. It so happens to be the method Las Vegas Tree Removal Pros recommend. It is much cleaner, less labor intensive for the homeowner and it is completed in the shortest possible time. Las Vegas Tree Removal Pros offer the best rates for this procedure in Vegas, and using the very best equipment, our skilled workers can have a stump removed from any area, and then clean the area as if there was no stump there in the first place. Stump grinding equipment can be hired,but if it is used in the wrong hands, it can be dangerous, or leave a yard in a real mess which would require professionals to correct. Rather than face the aggravation, it is much easier to call Las Vegas Tree Removal Pros, and get the job done right the first time with no waiting, and definitely no chemicals being used.